To possess is to have power. Those who strive to have or hold power, strive to own objects or people. One successful way of obtaining power is to – figuratively or actually – model the object one wishes to dominate. One reduces people to docile subjects or one miniaturises objects or areas to models or maps. Therefore, people in power enjoy studying the maps of to-be-colonised territories or the cardboard models and structures of real estate and city plans. Those who dwell in the miniature world of dollhouses or model trains are the queens and kings of an infinite world. Artists are usually not seen as people in power. But when the French cultural philosopher Claude Lévi-Strauss defined, in his book La pensée sauvage (The Savage Mind, Paris 1962), the work of art as a miniature model, he explains there has to be a connection between art and power. According to Lévi-Strauss, the miniature model is characterised by a drastic reduction of the original features of the object. This doesn’t imply a model has to be small: a monumental church can be a model of a reality of cosmic proportions. Even a photo, painting or sculpture at actual size is, according to Lévi-Strauss, a model because it strips the object of many of its properties. It is the reduction in either size or in characteristics that makes the model appealing to the spectator. Lévi-Strauss explains it like this: ‘In the case of miniatures, in contrast to what happens when we try to understand an object or living creature of real dimensions, knowledge of the whole precedes knowledge of the parts. And even if this is an illusion, the point of the procedure is to create or sustain the illusion, which gratifies the intelligence and gives rise to a sense of pleasure which can already be called aesthetic on these grounds alone.’ (1) In other words, the model puts the imagination in power. A stroll through a town centre to view its buildings often is a special experience for me. The dynamics of the city plan, with its streets and squares, are a physical experience that awakens the senses. A journey through its little streets and alleys, busy markets and docks, monumental squares and stately avenues is a grander spectacle than the rollercoaster in an amusement park. Some buildings provide, with their labyrinths of hallways, stairs and rooms, and their intrinsic flow of short and long lines of vision, a similar experience. And like any special experience, one wants to foster it, even long after one has left the city or the building. I tried several instruments to reduce or ‘possess’ the architecture of a city or building, such as illustrations, plans, pictures and blueprints. Recently, when visiting the exhibition of graduate students of the Design Academy of Eindhoven, I saw a new instrument that appealed to me: cardboard boxes that unfold to become the city plans of Paris, London or Berlin, and on which you can place, among others, a simplified model of the Eiffel Tower, the Arc de Triomph, the Tower Bridge and the Brandenburger Tor. Only, once back home these instruments just aren’t powerful enough to create the desired illusion of possession. Despite their initial appeal, they aren’t works of art capable of reducing the architectonical space in a meaningful way. What remains is a one-dimensional projection of what once mesmerised me – the space has escaped me. And it is exactly the physical and sensory experience of space that is essential to architecture. It is an experience that is intrinsically linked to the body. This is the paradox of possessing space: is it possible to possess space in an architectonical model in which the human body is the measure of things? Oscar Lourens is an artist. Since 1996, he has produced models of architectonical spaces he aspires to possess, mostly from a position of personal involvement. These spaces are often part of his day-to-day environment: the places where he eats, sleeps, works or exhibits his work. Lourens tries to ‘seize ownership’ of these spaces through systematic documentation, arrangement and reduction to a smaller, more feasible scale. In one of his first projects (1997), the model is simply a string of words attached to the flood dam of the city of Kampen. On the 1,400 metre long dam, a total of thirty-six words was placed, each providing a summary of the history of the house that lies behind it. Here, the word creates the illusion of a (lost) space. In 1998-1999, the rooms of the city hall in Bruges are no longer characterised by words, but by numbers: on the façade under the windows he gives the exact surface area of the floor of the room behind it. The spectator doesn’t create his illusion through words but through sizes of rooms instead. The idea of the surface area of the floor as a representation of space is further elaborated in Lourens’ largest project: La Lue. La Lue is a farmstead of 7 hectares in the French Allier consisting of four buildings, totalling thirty-five rooms. The complex is mapped in several ways. For example, untitled (Bibliothèque de l’architecture I) (2002), catalogues the exact sizes and blueprints (1:50) of the rooms. Blueprints again play a central role in his project on the lost cultural infrastructure of Arnhem (2001-2002). The fronts of the art galleries that disappeared in the city are depicted in relief on a 1:20 scale on a trigonal structure, which have been adapted to the size of the original buildings. But I think that with blueprints alone still too little room is left to the architectonical imagination of the spectator. This seems to be remedied when Lourens designs his second Bibliothèque, consisting of folders filled with simple A4 sheets, blank except for a code referring to the location in the original floorplan. Each folder contains a set of sheets that, when laid out following the codes, covers the exact area of the floor of a single room. In 2006, Oscar Lourens presents untitled (Bibliothèque de l’architecture II) in the exhibition ‘Espaces Relationnels’, together with a wall-filling print showing the laid-out sheets that make the blueprint of the building. A reduction of architecture to a print of a 1:1 map. This intriguing image reminds me of one of the ‘silly’ maps of the novel by Lewis Caroll, described in Matthijs van Boxsel’s Encyclopedie van de Domheid (Encyclopaedia of Stupidity): ‘Mein Herr (My Lord) speaks of a map that was repeatedly improved to reach perfection when it was on a 1:1 scale to the country it depicted. The farmers, however, objected to the map because they feared that, once unfolded, the map would cover the fields and block the sunlight. Then someone came along who suggested using the land as its own map. And to this day, the land performed this function for its inhabitants.’ (2) A better description of the paradox of possessing space isn’t possible. In the La Lue-project, Oscar Lourens adopts a new way to map the farmstead. After meticulous measurements of the rooms, Lourens draws a 3D model of the buildings’ interiors, including the positions of the doors and windows on a 1:50 and 1:100 scale. Subsequently, he applies a technique that can best be described as an analogous version of computer tomography (CT-scans). The complete interior space of the building from front to back is cut out of a series of firm (250 grams) A4 sheets. Placed behind each other in a card-index box, the sheets form a negative model: a template of the architectonical space through which one can make an illusionary journey through the house by flipping through the cards. What an idea! Lourens provides us with a razor sharp (or more appropriately, a paper-cut) image of the paradox. Like in a traditional architectonical model, Lourens reduces the architecture primarily to an organisation of space. Features such as texture, colour and material are eliminated. The great difference is that, although Lourens loses the working of the light (for there are no openings for the windows since the space is enclosed in paper), Lourens maintains the element of movement. And movement is intrinsically linked to experiencing space. For his Zonnehof-project (2007) Lourens creates various different models: one card-index box with cut out paper sheets, one traditional architectural model and two closed models that look rather massive. One of the latter is what would emanate when the space in the negative model were to be filled. In the closed models every possibility to experience the space through movement has disappeared. In addition to the models of the Zonnehof, Oscar Lourens takes pictures of the interior of the negative model, of which prints are exhibited on aluminium frames. These pictures, however, lack the physical experience of movement offered by the card-index boxes when one flips the cards through space. 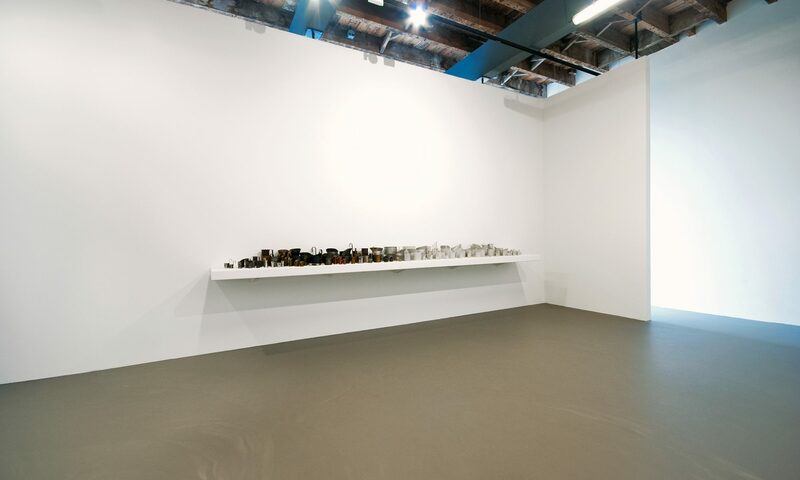 In his untitled (La Lue – film) from 2002 he uses pictures of the negative model to enlarge the space back to human dimensions in order to escape the small and narrow space of the card-index box. The paper ‘CT-scans’ are photographed frontally and projected one after the other in a fixed time interval and on a big screen. The result is a film, a slow movement, that draws the spectator into the space of the building until the last sheet of paper evaporates, as it were, in the white glow of the projector light. With this Oscar Lourens again introduces movement in his architectural models. However, the projection remains too small (it is not 1:1) and the movement too slow to be able to truly speak of an experience of space. Oscar Lourens exhibited parts of the La Lue-project on various occasions and in several locations. In some of these exhibitions he added a sign with the distance and the direction of the exhibition site to the La Lue farmstead. Similarly, to his earlier projects he used words and numbers to refer to real, physical spaces. But this time the reference wasn’t to the architecture of La Lue, but to the distance that separates the spectator of the exhibition to the real object, the farmstead in France. In search of new ways to get a grip on space, Oscar Lourens developed a plan, in the summer of 2007, to release carrier pigeons in La Lue and register the flight back to the Netherlands. For this occasion, one of the pigeons is equipped with an especially designed lightweight GPS system, which enables Lourens to reconstruct the flight on a map. Once known, he will follow the same route with a small aircraft to photograph from La Lue to the Netherlands. This photo series can then be reworked into a film that again introduces movement in the experience of space. Unfortunately, the pigeon never made it home and Lourens has to wait for a new flight season to continue the project. Oscar Lourens employs photography and film as means to bring the reduced space back to human dimensions. For the exhibition ‘Vormen van aarden / Ways to root’ (Apeldoorn, 2005) he draws upon the principle of magnification: using a scaffold construction and whitewashed plywood plates, Lourens creates ‘a new house for Helene’. Referring to the live-sized pinewood-with-cloth models that Helene Kröller-Müller had built on the Ellenwoude mansion near Wassenaar, which functioned as studies for the to-be-built museum. Likewise, Oscar Lourens’ creation is a blown-up but otherwise exact replica of one of the models of La Lue. But this ‘new house for Helene’ isn’t a study for the future architecture, but a new artistic attempt to realize the miniature model in original size. In 2005, Oscar Lourens trades his role of artist for that of an architect. For the owners of the La Lue farmstead he designs a square tower of 5 by 5 by 12 metres. The tower with a pointed roof consists of three floors on which two people can cook (ground floor), live (first floor) and sleep (second floor). The dimensions are loosely based on existing rooms in the La Lue buildings. Important to Lourens is also the choice of a compact and slender tower that fits the landscape. The materials, style and position to the other buildings and the landscape are chosen accordingly. This is the first time Lourens creates a new architectonic space of his own design. Herewith, his miniature art has grown to true architecture in which the wandering spectator/visitor is able to truly experience the actual space. That the building has left the realm of art and entered that of architecture is also clear from the reactions of neighbours and visitors of La Lue. Many of them think the tower is a restored building that has been a part of the farmstead all along. The tower led me to ask Oscar Lourens whether he hadn’t rather chosen for the profession of an architect instead of being an artist. After an initial hesitation, he confirms. This hesitation is very understandable, because my question is like that of the farmer of the Lewis Caroll’s novel, who asked Mein Herr to accept the existing landscape as the best possible map. For is the tower of La Lue not the best means to truly take possession of architectonical space?